Axis Empires Expansion Kit. 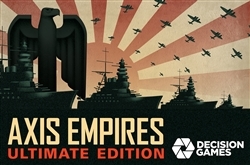 Fans of Axis Empires: Totaler Krieg and Axis Empires: Dai Senso will want to get this – it’s a big, big package designed to add even more enjoyment to our popular series of World War II grand strategy games. The AE Expansion Kit includes three parts. First, there’s Schiffskrieg, the air-and-naval expansion that provides additional detail for players who want more from the game beyond its abstract support units. Now players must base their air assets and ships (down to the cruiser level) on the map and move them to respond to threats. Air-naval combat, commerce raiding, anti-submarine warfare and naval construction are all accounted for while preserving that Krieg design elegance you know and love. Second, there’s Dice of Decision II, a much-expanded update to the Random Campaign Generator featured in Totaler Krieg! As before, you’ll be able to create new, very different Second World Wars based on alt-history paths from the Great War and the 1920s and ‘30s: What if the Tsar still ruled Russia? What if Germany had won the war in 1917? What if there hadn’t been a Great Depression? New for DoD II is everything related to Asia and the Pacific – now you’ll be able to explore alternate Pacific Wars: What if there were no Washington Naval Treaty? What if Japan’s 1931 involvement in Manchuria had unfolded differently? What if Gandhi had gained independence for India? Naturally, your alt-hist Europe and Pacific games will still link to tell a completely original Global War story. 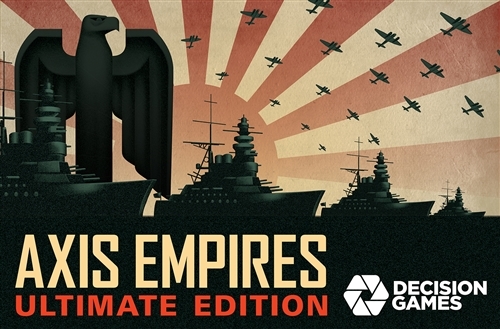 Finally, there’s the TK & DS Upgrade: everything you need to update your existing Axis Empires games to true “second edition” status without requiring you to buy whole new copies. The Upgrade incorporates six years of additional design, development and research since the 2011 publication of TK and DS. It also includes new optional rules and scenarios that had to be cut from those games for space reasons. Now you can play out that East vs. West “Separate Peace” scenarios and spring unexpected surprises on your opponents with “Fortunes of War” cards! Ownership of Axis Empires: Totaler Krieg or Axis Empires: Dai Senso required. Four maps; 1,120 small counters; 500 cards. Est. Retail $200 (est. pledge $150). Axis Empires Is currently being reviewed for production.